By precinct diffs. Those points above the horizontal blue 0 line are precincts that sided with Jack Luows. Those points left of the vertical red 0 line are precincts that voted against the jail. 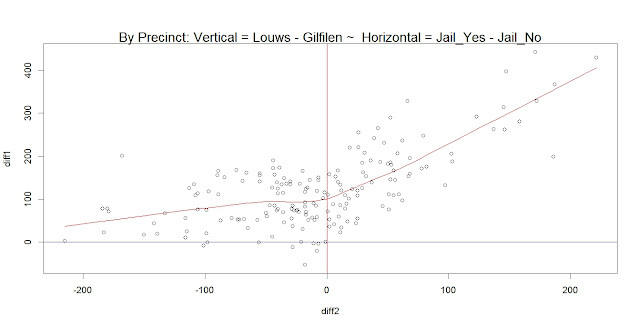 (Vertical Axis: (Louws - Gilfilen) ~ Horizontal Axis ( Jail_Yes - Jail_No)) . Strong relationships are revealed between those precincts voting more for Jack and the Jail (far right) and those voting more for Joy and not for the Jail (bottom left). The dense 'crook' in the middle of the graph represents those precincts still mostly totaling for Jack Luows but very split in voting for or against the jail. Click to enlarge. Far below is a table that ranks the top and bottom 15 by their yes and no votes on the Jail Bond measure. (WC_1y, WC_1n). Included are the Louws vs. Gilfilen executive race. The R code is here. If you need the matchback data, email me if you are a friend. AGGR43 = row summed total of all votes per precinct for 43 "all county" contests with at least two possible votes or candidates. This is a kind of gross measure of ballot participation rates per precinct. Those precincts that voted more for Jack tended to vote more for the Jail Bond. 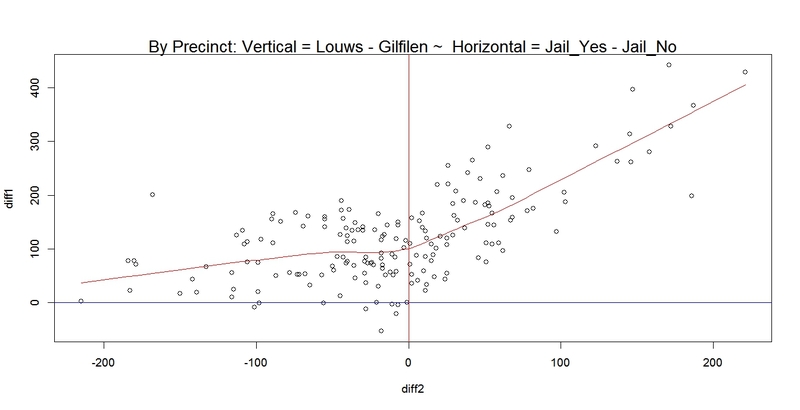 Those precincts that voted more for Joy tended to vote less for the Jail Bond. Despite my red/blue background colors below, all precincts in Bellingham are purple to some extent. However, these thirty precincts are less purple than others for these two issues. True to history, ten Lynden precincts showed strong support for Jack Louws and the Jail. All of the fifteen precincts with strongest percentage support against the jail can be described as core urban 200s series precincts from Bellingham.